Rutland water was constructed in 1975 and flooded a year later. It is the largest reservoir by surface area in the UK and is currently the source of Anglian Water drinking water. Nether Hambleton and Middle Hambleton were demolished and a dam was constructed near Empingham in order to build the reservoir. Upper Hambleton was, however, not demolished, and now sits on the peninsular in the middle of the reservoir. 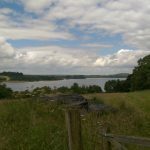 Rutland Water is now a popular area for both locals and tourists, with cycle paths and walk routes set up all around it. As well as this, there are loads of places of interest to explore. For those looking for something active to do, there is a rock wall, the Aqua Park, a sailing club, a cycle hire and a water sports centre. If you want to get onto the water, but would rather guarantee remainging dry, the Rutland Belle is the largest vessel on the reservoir. Tours are available, transporting you across and around the water with a voice-over tour, detailing the history and wildlife of Rutland Water. There are a number of places to get food and drink around the water. Four Fox catering kiosks are dotted around the water’s edge and there are pubs in the nearby villages, which you can very conveniently go by on the cycle route! Other landmarks around Rutland Water include Normanton Church, the dam by Sykes Lane and The Great Tower sculpture.